The easiest way to sort is with the sorted(list) function, which takes a list and returns a new list with those elements in sorted order. The original list is not changed. It's most common to pass a list into the sorted() function, but in fact it can take as input any sort of iterable collection. The older list.sort() method is an alternative detailed below. The sorted() function seems easier to use compared to sort(), so I recommend using sorted(). The sorted() function can be customized through optional arguments. The sorted() optional argument reverse=True, e.g. sorted(list, reverse=True), makes it sort backwards. For more complex custom sorting, sorted() takes an optional "key=" specifying a "key" function that transforms each element before comparison. The key function takes in 1 value and returns 1 value, and the returned "proxy" value is used for the comparisons within the sort. For example with a list of strings, specifying key=len (the built in len() function) sorts the strings by length, from shortest to longest. 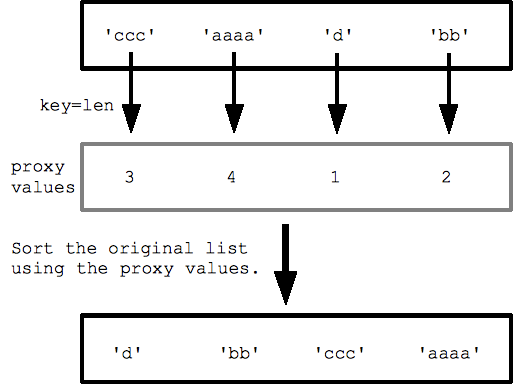 The sort calls len() for each string to get the list of proxy length values, and then sorts with those proxy values. ## Say we have a list of strings we want to sort by the last letter of the string. ## Write a little function that takes a string, and returns its last letter. ## This will be the key function (takes in 1 value, returns 1 value). To use key= custom sorting, remember that you provide a function that takes one value and returns the proxy value to guide the sorting. There is also an optional argument "cmp=cmpFn" to sorted() that specifies a traditional two-argument comparison function that takes two values from the list and returns negative/0/positive to indicate their ordering. The built in comparison function for strings, ints, ... is cmp(a, b), so often you want to call cmp() in your custom comparator. The newer one argument key= sorting is generally preferable. The above is a very common misunderstanding with sort() -- it *does not return* the sorted list. The sort() method must be called on a list; it does not work on any enumerable collection (but the sorted() function above works on anything). The sort() method predates the sorted() function, so you will likely see it in older code. The sort() method does not need to create a new list, so it can be a little faster in the case that the elements to sort are already in a list. A tuple is a fixed size grouping of elements, such as an (x, y) co-ordinate. Tuples are like lists, except they are immutable and do not change size (tuples are not strictly immutable since one of the contained elements could be mutable). Tuples play a sort of "struct" role in Python -- a convenient way to pass around a little logical, fixed size bundle of values. A function that needs to return multiple values can just return a tuple of the values. For example, if I wanted to have a list of 3-d coordinates, the natural python representation would be a list of tuples, where each tuple is size 3 holding one (x, y, z) group. To create a tuple, just list the values within parenthesis separated by commas. The "empty" tuple is just an empty pair of parenthesis. Accessing the elements in a tuple is just like a list -- len(), [ ], for, in, etc. all work the same. To create a size-1 tuple, the lone element must be followed by a comma. It's a funny case in the syntax, but the comma is necessary to distinguish the tuple from the ordinary case of putting an expression in parentheses. In some cases you can omit the parenthesis and Python will see from the commas that you intend a tuple. Assigning a tuple to an identically sized tuple of variable names assigns all the corresponding values. If the tuples are not the same size, it throws an error. This feature works for lists too. You can add an if test to the right of the for-loop to narrow the result. The if test is evaluated for each element, including only the elements where the test is true. To practice the material in this section, try later problems in list1.py that use sorting and tuples (in the Basic Exercises).